We work one-on-one with clients to help find solutions to framing projects of all sizes. Our expert staff will guide you through the entire process, helping you choose the best design for the presentation and preservation of your art, photographs, and mementos. 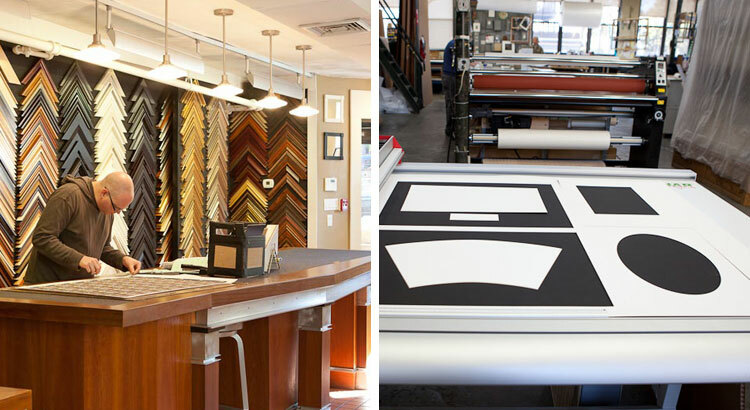 We feature an extensive inventory of frames, ranging from hand carved historic reproductions to contemporary profiles. With thousands of options, you are certain to find the perfect moulding for your art. We have the materials and expertise on-hand to create one-of-a-kind pieces, as well. We also carry welded steel, aluminum, and custom-designed acrylic box frames. We use only museum-quality conservation grade mat boards, and our staff will advise you in choosing both color and the most appropriate handling for the preservation of your art. We feature hand wrapped linen and silk matting options, as well as custom French matting options. Using the latest in printing technology, we can even print text and logos on mats for corporate projects. We have a multitude of glazing options from the most basic to the most technologically advanced products available. We feature a full line of UV filtering products, in both glass and acrylic. Our consultants will advise you on the best option for your work, be it a simple clear glass option or state-of-the-art anti-reflective Optium Museum Acrylic. In addition to creating exquisite finished pieces, we know how to handle them. Let our experts deliver and install your artwork after we have framed it. While our services are only available in the Boston metropolitan area, we are happy to refer you to our shipping partners for longer hauls and out of state installations. Our Marlborough Street retail store, located in Boston’s Back Bay, offers a unique collection of framed and unframed original prints featuring antique maps, botanicals, and Audubon Octavo prints. Please call or visit our location at 411 Marlborough Street for more information.